If you have been injured in an accident that was not your fault it can take some time to come to terms with the experience. It is a difficult time, physically, emotionally and financially.It is likely that this will involve taking stock of where you are physically, emotionally and financially. In fact, it may only be until several months or years after the event that you will have a full appreciation of the accident’s impact. Speaking with a personal injury solicitor can help you negotiate this process with confidence. Not only can a good solicitor help you claim monetary compensation for your pain, losses and expenses; an experienced specialist can also help you overcome the many practical challenges you are likely to face in the aftermath of an accident. Practical decisions are necessary. When it comes to deciding whether to make a compensation claim for the injury you have suffered, the deciding factor is often one of cost: can you afford the expense of making a claim? Personal injury solicitor fees can be expensive, while court fees and expert witness fees can all accumulate, particularly in complex cases or for those in which the defendants seek to stubbornly refuse liability even in the face of seemingly overwhelming evidence. 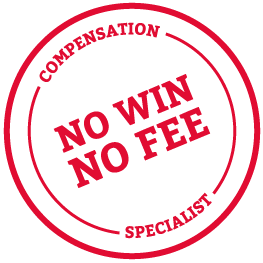 This is where a No Win No Fee arrangement can be a guiding light; not only does it ensure that unless you win you won’t have to pay a penny to fund the cost of your claim, it also helps level the playing field, ensuring you have expert legal representation that is every bit as qualified as that of your opponent. In addition, our solicitors can help with important matters such as, when appropriate, securing interim funds for the provision of specialist equipment, and care. Thompsons has put together an outstanding No Win No Fee package to protect you from financial worry and to fully safeguard your interests throughout the course of a personal injury compensation claim. If you'd like to know more about our No Win No Fee service, this video will explain why you'll have absolute peace of mind when making a claim with Thompsons. If you would like to find out more about the credentials and funding options provided by Thompsons Click here for more details. Give us a call on 0800 0891 331. One of our specialist personal injury lawyers will chat things through with you, free of charge and with no obligation.